This e-book explores how to take the P2P process, one of the end-to-end solutions often implemented first, to the next level. 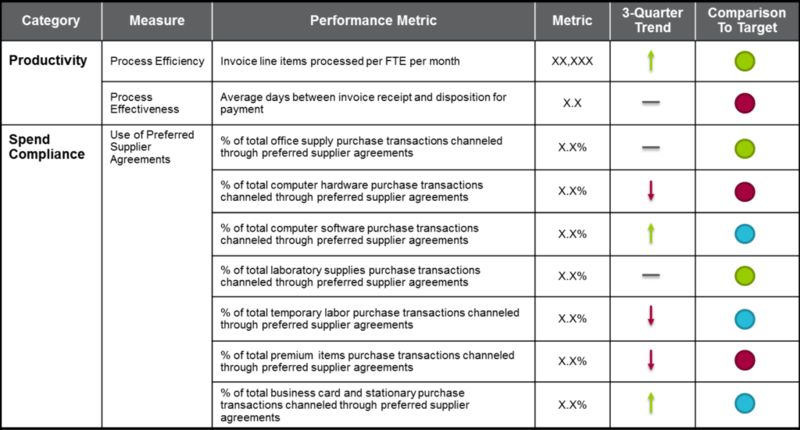 If you’re curious to learn about inventory optimization practices and performance metrics, this report includes a summary of ScottMadden and Oniqua's survey results—some expected and some surprises. This case study reviews how ScottMadden developed an end-to-end procure-to-pay model that could accommodate the expected growth of an organization. A Fortune 100 pharmaceutical company sought outside perspective to perform an assessment of its internal procure-to-pay (P2P) operations. Once the appropriate measures were in place, management wanted to identify initiatives that would improve the efficiency and effectiveness of this process. ScottMadden was retained by the client to determine how well its P2P practices compared with those of leading organizations. ScottMadden then developed recommendations designed to transform the client’s current P2P process. The client’s management wanted to determine how well its current P2P practices compared to those of external leading companies (both pharmaceutical and non-pharmaceutical). To properly assess the P2P process, the ScottMadden team assembled proprietary and externally available benchmarks and leading practices for purchasing and accounts payable and then compared these to the internal practices of the client. The team conducted site visits to shadow and interview key accounts payable and purchasing personnel, and they collected performance data and practice information related to the client’s current P2P process. The ScottMadden team followed their “P2P Excellence” methodology, but limited the scope of the review to a high-level assessment of current state practices coupled with a partial gap analysis. ScottMadden had a history of successful projects with this client. For this specific project, the client wanted deep involvement by partner-level consultants to conduct a thorough, but practical, analysis and to develop actionable recommendations. ScottMadden leveraged its robust P2P experience and brought top supply chain experts, as well as a large database of P2P leading practices and performance benchmarks, to the project. 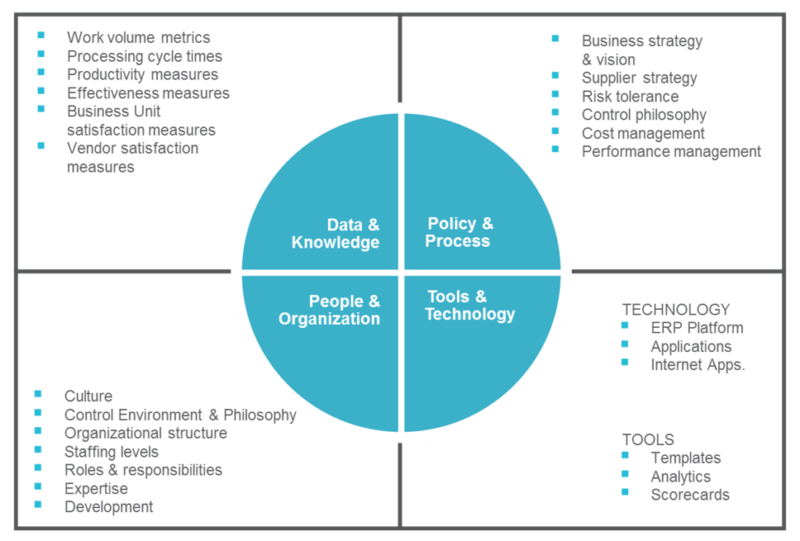 To better understand the nature of the P2P environment and workflow, the ScottMadden team utilized an analytical framework consisting of four categories: 1) people and organization, 2) policy and process, 3) tools and technology, and 4) data and knowledge. Leading practices were examined under each of these categories. Elements in each category were compared to the client’s ongoing practices. ScottMadden facilitated the evaluation of these practices on two scales: 1) breadth of usage and 2) depth and extent of usage. This assessment allowed ScottMadden to compare the client’s adoption of leading practices to those of other companies and locate the client on ScottMadden’s “P2P Maturity Model.” This three-stage model (shown in Figure 3) depicts the P2P practices adopted by companies as they move from the initial P2P building blocks to an integrated P2P model. As often happens, the client’s current practices fell within different stages of the maturity model, but they were mostly identified with those companies at a “Stage 1” level of maturity. The opportunity for this client was in adopting practices that would help them move to “Stage 2” or further. The ScottMadden team also examined in detail the client’s current state organizational design and business practices related to the P2P process. In conducting this analysis, the team divided the client’s practices into “upstream” and “downstream.” Upstream practices or processes began with user-requisitioning and ended with the submission of a complete purchase order. 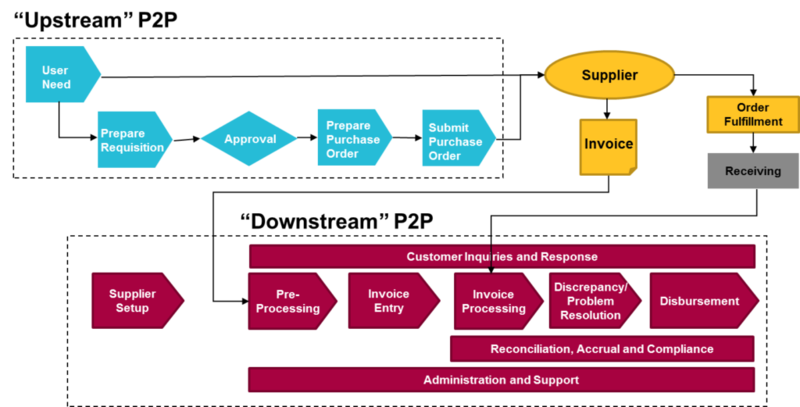 Downstream practices or processes began with supplier setup and ended with supplier payment as shown in Figure 4. Over the past several years, the client’s volume of upstream P2P transactions had increased significantly due to organic and merger growth. This increased workload was putting pressure on both the upstream and downstream processes and associated organizations. Upstream P2P practices were clearly affecting downstream cost, productivity, and quality. The variation in P2P policies and practices – Upstream P2P business practices varied by division and site. These differences drove additional workload and process inefficiencies in downstream P2P activities. Degree of automation employed – Upstream purchasing options were tied to specific downstream payment processes. The degree of manual intervention required by each payment process varied by division. The adoption of technologies associated with lower manual intervention was slow at the client’s site. The number of process exceptions that occurred – Process exceptions were originating within many of the P2P stakeholders. Most process exceptions occurred in the upstream P2P process, which was not designed to identify the root causes of process exceptions where they originated. As a result, common errors were frequently repeated to the frustration of the downstream P2P staff. Following the comparison of the client’s performance (metric benchmarking) and adoption rate of leading practices (practice benchmarking), the ScottMadden team identified a range of recommendations designed to move the client to the next stage of P2P maturity. Recommendations included: 1) increasing the volume of spend channeled through approved suppliers, 2) enforcing greater use of purchasing processes that are advantageous to the company as a whole, 3) establishing a more robust P2P governance structure, and 4) tracking executive-level metrics separately for each business division and for the client as a whole using a simple scorecard that highlights key comparisons and trends. 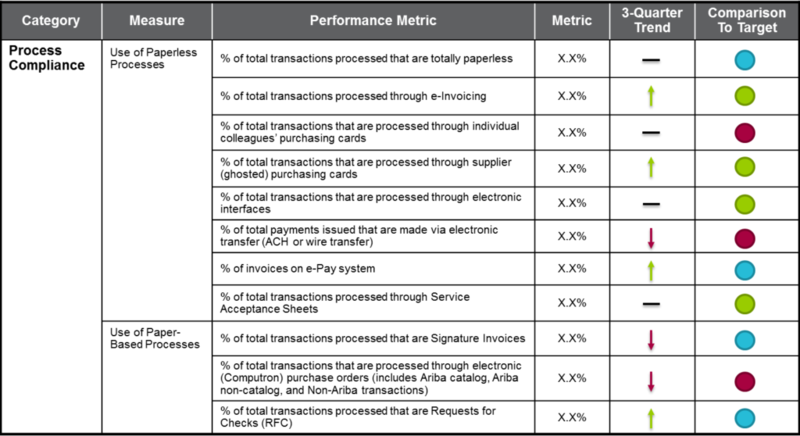 An example of the performance scorecard is shown in Figure 5. Following the assessment, ScottMadden assisted this client by preparing written policies that mandated compliance with corporate purchasing standards. 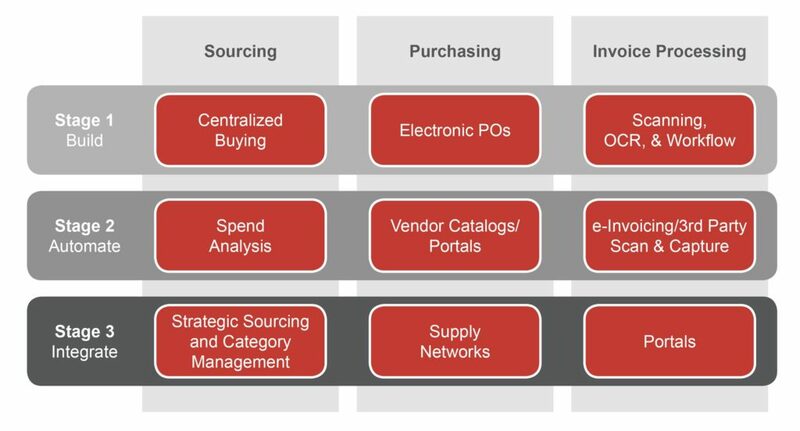 ScottMadden created a “Directed Sourcing Matrix,” which listed how goods and services within each spend category should be acquired and paid for. ScottMadden also designed a process for improved tracking and reporting of purchasing compliance. The ScottMadden team and client executives were excited about the identification of key opportunities to improve the efficiency and effectiveness of their P2P process. 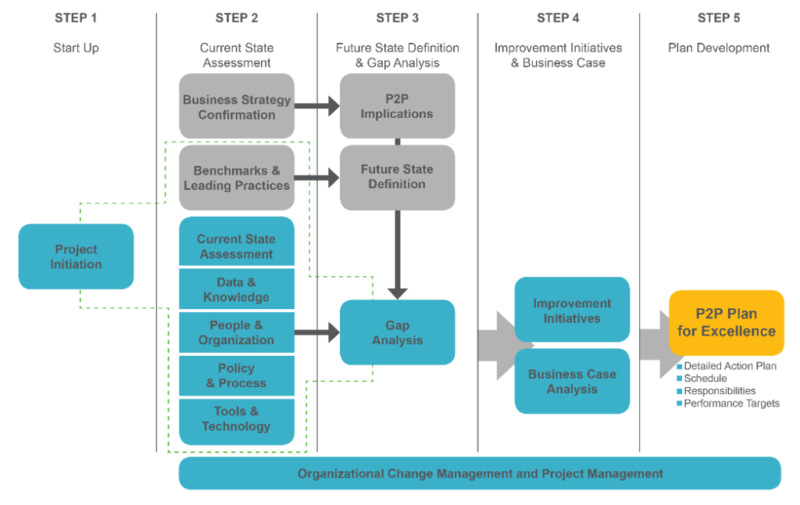 Because of the organizational change management and project management provided, the organization has begun to work more collaboratively and has demonstrated improvements in key P2P metrics. The fact that progress is being made is a testament to the passion and commitment of key managers driving upstream and downstream P2P changes.